New age metal anyone? Well here is one of the few examples of such a combo and perhaps one of the greatest style shifts between first and second album in all of rock history, well at least in the metal world. 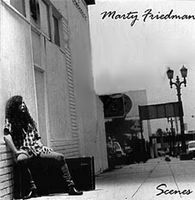 MARTY FRIEDMAN needs no introduction and stunned the world with his outstanding unique style of neoclassical shredding skills with his days with Jason Becker in Cacophony on his solo debut "Dragon's Kiss" which was more than enough to win over Dave Mustaine and earned him a spot as lead guitarist in Megadeth creating some of the tastiest thrash metal ever to grace the ear drums. After a few years with Megadeth touring and creating metal music MARTY said that he burned out on the whole metal thing and needed a break from the style and wanted to experiment in other styles. The result of this desire was realized when he hooked up with composer and producer Kitaro, a fairly well known Japanese new age artist who has released a ridiculous amount of albums. SCENES is a strange anomaly of a musical experience. It is first and foremost a guitar album but this is way different than what Shrapnel Records was known for. Much more known as a shredder's paradise which gave FRIEDMAN exposure to the greater musical world, SCENES is not only a departure for FRIEDMAN from his metal-centric reality but for the label as well and the best part of which is that the notorious crappy tinny shoddy production values that Shrapnel Records was famous for is thankfully missing here. This album is crisp and clean and every tiny sound being magnified into its full potential. The music is a strange hybrid of exotic Eastern inspired cleanly played guitar scales with symphonic atmospheres shrouding every single note. The guitar playing is very tasty and instead of MARTY's usual million notes a second methodology, he plays slow to mid tempo arrangements that after fully unfolding accompanied by lush symphonic orchestral type arrangements only then explodes into a harder edged rock and metal with his electrified solos. Everything though is quite calculated and slave to the melodic developments. Nothing is left to improvisation or "unwelcome" notes. There is a clear Japanese influence on this one signifying FRIEDMAN's ever growing fascination with the Oriental world and musical styles even to the point that his future wife Mimi also contributes vocals in Japanese on "Realm Of The Senses" the most obvious Oriental sounding track of the lot. In case you are familiar with "Dragon's Kiss" the last song "Triumph" on here is indeed a new age version of "Thunder March."